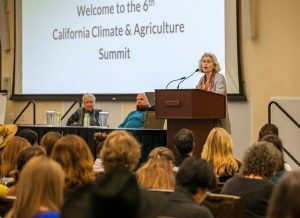 In early March, over 400 of California’s foremost experts on climate and agriculture gathered at the 6th California Climate and Agriculture Summit to share insights, experiences and questions about the challenges facing California agriculture in the face of climate change and the tools and resources needed to mitigate and adapt to it. 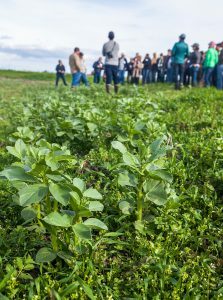 On the first day of the Summit, about 100 people toured three very diverse farming operations in the Yolo/Solano County region to learn about agricultural climate solutions offered by each. The innovative farms included a five-acre diverse organic operation, a 6,800-acre ranching and conservation project and a 15,000-acre conventional farm growing rice and several other crops. Key themes of the day highlighted the importance of partnerships in achieving climate benefits on farms and ranches, and the critical role that farms of all types and sizes can play in achieving the state’s climate goals. 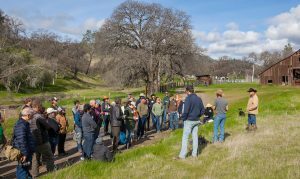 At Bobcat Ranch, a stunningly beautiful 6,800-acre oak woodland and grassland property owned and managed by Audubon Society, the focus is on conservation and rangeland management for habitat protection and carbon sequestration. Cattle are used as a management strategy to improve soil, provide fire abatement and manage invasive species. Leasee Scott Stone from Yolo Land & Cattle Co., Dash Weidhofer from Audubon Society and Corey Shake from Point Blue Conservation Science talked about the power of agriculture for providing a host of environmental benefits. We also visited Cloverleaf Farm, a five-acre woman-owned diversified organic fruit and vegetable operation near Dixon where we learned about their water conservation project funded by the State Water Efficiency and Enhancement Program (SWEEP). In addition to converting a water pump from diesel to solar power, they also use efficient irrigation technology and monitoring systems to simultaneously save water and optimize fruit flavor. Our last stop was at River Garden Farms, a 15,000-acre conventional rice, grain and walnut farm near Knight’s Landing where we learned about a Healthy Soils grant they received last year. They are working with Audubon Society, the Yolo County Resource Conservation District and the National Center for Appropriate Technology to install a large hedgerow along two miles of rice fields to sequester carbon and provide pollinator and wildlife habitat. Additionally, the farmers are experimenting with cover crops on rice fields over winter. 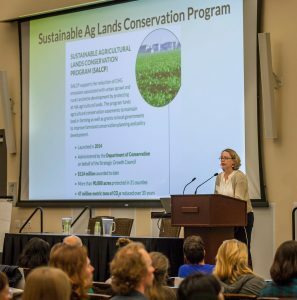 Influencing the design and implementation of four cap-and-trade funded “climate smart agriculture” programs that incentivize farmland conservation, improving soil health and carbon sequestration, on-farm water conservation, and methane emissions reductions on dairies. CalCAN recognized five agricultural climate leaders, including farmers/ranchers, an agricultural professional, a policymaker, a legislative staff member, and researcher, who exemplify the unique roles and initiative that is critical to the collaborative progress that CalCAN seeks in the policy, science, and practice of climate-friendly agriculture in California. We look forward to our continued engagement with you—members of our statewide network of growers, advocates, researchers and agriculture experts—as we enter our second decade of work to realize our vision for California agriculture: To achieve a widespread transition to sustainable and organic agricultural systems that are increasingly resilient, environmentally sound and healthy, and that provide climate benefits, protect our natural resources, sustain our food security, provide for economically vibrant agricultural communities, and maintain our finite agricultural lands.